This picture is another more, of many, homage to human stupidity. Catalonia, which I have in my hart, has two official languages. Catalan, the historical language of the land and Spanish, the language of the whole country. Spanish, the language of Cervantes, spoken by 500 million homo sapiens in this planet is the third most known language of the world after Mandarin(1051M) and English(980M). I'm proud to be one of those 500 million. Catalan, the language of Ramon Llull and my ancestors, is spoken by ~12 million homo sapiens . I'm also very proud to be one of those 12. But we humans can't get read of our heritage. Our genes, once found useful to incorporate a treat that we can put like: "you are like me, you are my friend. You are not like me, you are my enemy". Some australopithecus descendants living in Catalonia have carved this monument to stupidity. 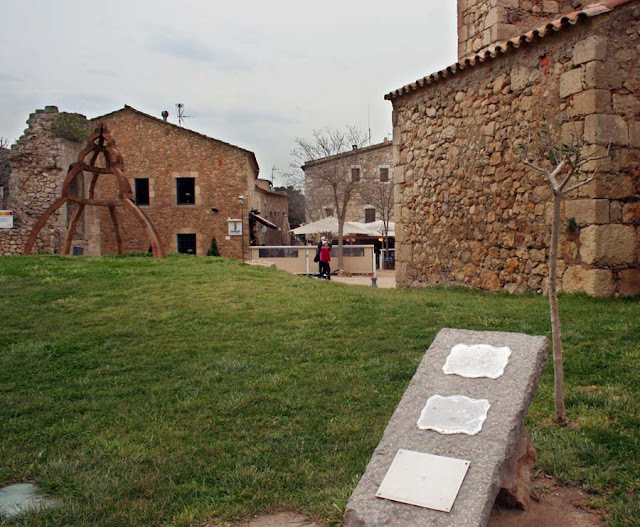 In Sant Miquel d'Ampuries you can find three plaques in memorial of the introduction of olive crops in Catalonia 2500 years ago. One in Catalan, one in Spanish and the last in English. You can only read the English version, the other two had been vandalized. Destruo, ergo sum. Algo he entendido, TreeHugger, aunque no todo. Tuve en mi infancia un buen profesor de inglés, pero luego vinieron otros, no tan buenos, para éste mal alumno. Want to practice some english? get it from amazon! I like my friend "Estif"